Here is a chance for the adventuresome to get away from the crowds, get behind the wheel, and enjoy the lush countryside on a self-guided tour. You will be escorted from the pier to the nearby starting point and after brief formalities you will be given the keys to your rental car. Armed with a map of the island, some suggested itineraries, and some details about historical facts and points of interest, you’re ready to explore this beautiful island at your own pace. The cost is for the car; one to four people can explore at just one rate. Please note: Participants must be able to drive a stick shift in bumpy and hilly conditions. Bring your swimsuit, a credit card, and a current driver’s license. The tour price is per car and includes CDW insurance, a $750 deductible which will be fully or partially charged to the driver’s credit card in the event the car is returned damaged. Fuel costs are included. Pricing is per car, and can hold up to 4 guests. Only one person in the party needs to purchase the tour. Your touring time may be shorter depending on when your ship docks. This is an exclusive panorama island tour for two to six people with a local, English speaking driver/guide in an air-conditioned vehicle. Experience the local highlights as you wish, at your pace. Please note: Wear comfortable shoes and clothes. Caribbean music and the friendly crew of a well-appointed, full-sail catamaran will welcome you aboard. This boat is specially designed to offer shade and refreshing breezes as you sail along the beautiful west coast of the island to the Marine Park at Colombier Bay. You will anchor about 80 feet offshore, close to coral reefs teeming with schools of colorful fish. A professional instructor will give you a full orientation and explain the use of the snorkel equipment. You will have time to swim and snorkel, or simply bask in the sun. On the return to Gustavia, soft drinks, beer, or refreshing rum punch or fruit punch will be offered. Please note: This exclusive experience is limited to 14 guests and sells out quickly. No previous sailing experience necessary. The catamaran will offer refreshments throughout the trip. Restrooms are located on board the catamaran. Bring sunscreen, hat, swimsuit, and underwater camera. Snorkeling gear is available on the boat. Boarding your sailing cat you will depart from Gustavia's tender pier. Your Captain will give a safety briefing as you set sail. You will be able to enjoy some good sailing time as you head to “Pointe de Colombier” and its sheltered bay. You can enjoy the scenic panorama, passing the mega yachts at anchor. Once at anchor in Colombier Bay, you will have time to sunbathe, relax, sleep on the trampoline net or just read a good book under the shade of the bimini. The Captain will serve you mineral water, soft drinks, beer or rum punch and light snacks and the crew will be attentive and helpful all the while. Please note: There is no transportation available to the beach. Bring a sunglasses and plenty of sunscreen. You will board the ship with a gangway that can be tricky because of the recurrent swell in Gustavia harbor. You will have to remove your shoes and be barefoot before boarding the vessel. The Captain is solely responsible and has the right to refuse boarding to a guest who would be judged unable to participate. Boarding your sailing cat you will depart from Gustavia's tender pier. Your Captain will give a safety briefing as you set sail. You will have a peaceful and quiet sailing time in the vicinity of the harbor area to enjoy scenic views of the sunset. You will appreciate the scenic panorama, passing the mega yachts at anchor. The Captain will offer you Champagne, mineral water, soft drinks or beer and some assorted light snacks. The crew will be attentive and helpful. Please note: You will board the ship with a gangway that can be tricky because of the recurrent swell in Gustavia harbor. You will have to remove your shoes and be barefoot before boarding the vessel. The Captain is solely responsible and has the right to refuse boarding to a guest who would be judged unable to participate. All aboard a semi-submersible to discover the rich undersea life surrounding St. Barts, without even getting wet! After boarding, you may choose to either stay outside on the open deck or enter the tunnel-like hull equipped with underwater windows. At the harbor’s entrance, keep watch for the many green turtles that frequent this area. Soon, the semi-sub passes over the wreck of the island freighter Marignan. Cross the southeastern edge of the St. Barts Marine Park and arrays of undersea marvels will soon be revealed before your eyes. The seabed is full of colorful coral reefs, and schools of Sergeant Major Fish. On your arrival at The Saints, the onboard crew will feed schools of fish. Don’t be surprised if seemingly hundreds of fish almost push against your window. You may even glimpse a shark or two! After approximately 10 minutes, your semi-sub heads back to the pier. You may wish to stay out on the upper deck for picturesque views of the coastline and graceful anchored yachts. Please note: The semi-submersible has steep interior steps. The itinerary may be amended at the Captain’s discretion based on weather conditions, general safety, or any other factor. There can be no guaranteed sightings of any specific sea life. Take a drive on the wild side on an ATV tour along the uninhabited and unpopulated roads of Foxes Bay. You will drive past silent villages well preserved by nature and perhaps you may be lucky enough to grab fruits directly from low hanging branches of fruit trees only disturbed by birds. Catch a glimpse of what village life used to be and enjoy riding through villages and streets once filled with busy people now filled with abundant plant life and silence. What an exciting way to see Montserrat. Please note: To operate an ATV you will need your driver’s license and be willing to sign the required waivers. Guests must wear all required safety gear provided. Actual driving time is 1.5 hours. This tour is not for children, minimum age is 21 years old and maximum weight is 200 lbs. Guests must follow the directions of the tour guide as there are no markers and no one to ask directions. Price is per ATV. From Little Bay you will drive through Brades and on to Woodlands and Salem. Your first stop would be at Runaway Ghaut where local lore says that if you drink the pure spring water flowing from mountains in the heart of island that you will return to Montserrat. Then it’s on to Richmond Hill where you will get a bird's-eye view of the Buried City while standing poolside at the abandoned Montserrat Springs Hotel. You will drive through abandoned villages and towns with buried and decaying buildings, some now covered in climbing plant life. And in the Buried City you will stand on what used to be the deep water harbor and behold the majesty of the tallest mountain on Montserrat growing out of where once stood churches, schools, homes, and places of business. Head out of the Buried City to the Woodlands Beach facility where you will be served an exotic Caribbean lunch including Calypso chicken, seasoned rice, and plantain fritters. Relax under the canopy of almond trees and sip on your rum punch. You will have time to browse the local craft dealers’ stands at the Woodlands facility and take a piece of Montserrat’s volcano home with you. Please note: Bring your camera. Conditions in the Buried City are dusty and may impact those with respiratory problems. Dust masks will be provided. Visit the Montserrat Volcano Observatory and experience 25 minutes of sheer volcanic drama as you view an intimate and up-close video of life with an active volcano. And if it is your lucky day, a passing resident scientist may even bring you up to volcanic scientific speed by answering all your burning questions. You will see Plymouth from the Observatory deck and view samples of volcanic rocks. There will be time to shop for volcano souvenirs from the Observatory. Then you will head over to the Montserrat National Trust and take a guided walk through the Trust's Amerindian Gardens. Browse the Trust Gift shop for local cookbooks, birds of Montserrat books or books on Montserrat history, institutions and people by local historian, Sir Howard Fergus On your way back to Port Little Bay you will stop in to the Hill Top Coffee House and Welcome Centre and enjoy a complimentary beverage as you browse more volcano memoirs and history. Please note: The road to the Observatory is narrow and winding. Driving is on the left-hand side. Persons prone to motion sickness should take the necessary medication prior to the start of the tour. The Observatory has two floors and stairs. Wear comfortable shoes or sandals with rubber soles. Your adventure in an open-air 4X4 vehicle begins with a drive through the capital to Morne Bruce for amazing views and photo opportunities. You will wind through the mountains to the renowned Wotten Waven Sulphur Springs to see the remnants of volcanic activity. Travel further into the rainforest to the Ti Tou Gorge, one of the filming sites for Disney’s “Pirates of the Caribbean 2 – Dead Man’s Chest” movie. Ti Tou Gorge is one of the few crater lakes in the Caribbean. You will discover a crevice in the mountain where both hot and cold streams intermingle into a natural rock pool and you can take a swim if you choose. Swim between the mountains to discover a crystal-clear waterfall. Complimentary rum punch and fresh fruit will be served before you return to your yacht. Please note: Wear your bathing suit under your clothes and bring a towel. This two-hour fun adventure will introduce you to Dominica’s premier snorkel site, Champagne Reef, a local marine eco-system dotted with Champagne bubbles, colorful fish, and an assortment of coral and sponge life. Your experience will start with a short coach ride to the marine center. After the orientation, you will board your boat and head off for a 15-minute ride to the Champagne Reef where you will begin your snorkeling tour – much like swimming in a glass of Champagne and through a stream of bubbles that rises from a submerged volcanic vent in the sea floor. From there you will return to the marine center where you will be provided with a fresh water rinsing facility and bottled water before heading back to your yacht. Please note: Bring your swimsuit, towel, and sunscreen. This is an open-air culinary adventure, where you will spend a day with a local family and learn about Dominican flavors, traditions, and family lifestyles, and prepare and create traditional Caribbean dishes and fruit cocktail blends from local produce. Your day will begin with a bus ride from the wharf to a home nestled in the tropical rainforest. En route, take in the panoramic view of the lush landscape punctuated by the colors of flowering trees, bougainvillea, lilies, and enormous bamboo. You will be greeted by your hostess, and introduced to the herbs and fresh organic products that will be used. Today, your choices will be endless – you can prepare a local delicacy, enjoy views of the mountains or the Caribbean Sea, or stroll on the property learning about the fruits and spices. Regardless, you will be guaranteed full servings of fun, rum, and laughter. Feast on mouth-watering dishes that you have created, served with Caribbean desserts, and fruit and rum punches. On completion of your meal, you will return to the wharf. Please note: Due to the limited number of participants allowed and the popularity of this tour, it fills up quickly. Please note: Wear comfortable walking shoes. Life jackets will be provided. Get set to get wet! This adventure in the “land of 365 rivers” is wet and wonderful from beginning to end. A 45-minute drive will bring you to the launch site for the safety briefing, after which you will be provided with your life vest, modified inner tube, and a paddle before getting into the river. Once everyone is in the water, your guides will set you loose to begin your journey, gently spinning and swirling in the current, taking in the changing exotic scenery at the same time – if you can! You will stop briefly to enjoy a popular Dominican pastime – river bathing – before continuing down the scenic river to your exit point. The professional guides are only a shout away to ensure your comfort and safety all the way to the end. Back on land again at the Reception Center, refreshments, including their famous rum punch and fresh fruit will be served before you return to your yacht. Please note: Wear your swimsuit under your clothing and bring a towel. This 3-hour fun adventure will lead you through Dominica’s unspoiled nature with opportunities for viewing stunning landforms – forests, rivers, hot water pools, and bubbling sulfur mud ponds. Your experience will start with a coach ride from the pier to the Roseau Valley and through the lush, verdant greenery of this nature island, to see the world renowned Trafalgar Waterfalls – nature at its best. You will see the picturesque landscapes, exotic flora and fauna, and the greenest rainforest in the Caribbean region. Then you will depart for a nature spa experience, a short drive away and you will have the opportunity to explore a nature sanctuary filled with fruit trees, tweeting birds, tropical blooms, flowing streams, a waterfall, and natural sulfur deposits – (hot) therapeutic sulfur water tubs, cool water streams for rejuvenating, and opportunities for learning about the natural product sold here – you will lose yourself in this paradise on earth. Then you will then be served your choice of fruit punch or rum punch before heading back to the ship. Please note: Bring water shoes, swimsuit, towel, and sun screen. Dominica has earned the reputation of being one of the top five dive destinations in the world. In addition to unique dive sites like “Champagne,” which features a bubbling, underwater hot spring, Dominica’s reefs are full of gorgeous multi-colored hard and soft coral, an abundance of reef fish, and fascinating marine critters such as seahorses and frogfish. Your dives will take you to a depth that will range from 90 to 110 feet, where you will explore the waters of L’Abyme, the very definition of an abyss – it is a plunging wall that drops 1,500 feet into the deep blue. Your second dive will bring you to a wreck lost deep in the waters, where you will be sure to encounter a vast array of spectacular marine life. The underwater terrain is unique and diverse, providing dive sites suitable for all skill levels. Divers will be accompanied by qualified dive masters and instructors. Complimentary refreshments will be served at the end of the tour. Please note: Wear your swimsuit under your clothing; bring a towel. Waiver release forms must be signed and medical conditions must be disclosed. Bring your C-card. All gear will be provided or you can bring your own. All staff is trained in CPR and first aid. This adventure will traverse Dominica’s mountainous interior and the Morne Trois Pitons National Park World Heritage Site, skirts the slopes of steaming rainforests, crosses countless rivers and dramatic gorges, and offers spectacular breathtaking panoramas. You will board your coach for the 30-minute drive to Fresh Water Lake, often drenched in mist and tranquility. The 90-minute walk along a thin roller-coaster-loop-trail and along ridges will provide beautiful panoramas of the lake and surrounding area. Then, you will journey further inland to the Boeri Lake and a 2-hour (return) hike along hilly and stony terrain through thick rainforest. The trail to this mountain crater is wild and full of bright colored blooms and pristine vegetation and surface streams. Chirping birds fuel this already energetic walk. At the lake you will enjoy a brief rest to recharge before heading back to your tour vehicle. You will have a picnic lunch and head for the Titou Gorge for a short swim up through a narrow opening to a waterfall that is guaranteed to provide an adrenalin rush. You will be required to wear a life vest for this swim. And then you will head back to your waiting yacht. Please note: Bring your swimsuit, towel, insect repellent, and sunscreen. Wear comfortable, sturdy walking shoes for the rugged terrain, ridge walking, and narrow trails. You will board a 60-foot catamaran and hear a briefing on your tour, some history of the area, what to look for as you travel, what species live in these waters and their behavior patterns. There are no guarantees what animals you may or may not see but you will be in natural habitat for whales and dolphins. You will cruise for 3.5 hours along the west coast of Dominica, 2-8 miles off shore as you search for wildlife. Periodically the boat will stop and hydrophones will be put into the water. This is done to listen for the rhythmic clicking of Sperm Whales, the pinging of Pilot Whales, the whistling of Dolphins, or the singing of Humpbacks. During this period you will hear educational commentary as well. Most commonly seen animals are: Sperm, Pilot, False Killer Whales, Spotted, Spinner, and Bottle Nose Dolphins. The minimum distance for approaching these animals is 160 feet. There is no in-water activity. This is a calving area and the welfare of these animals is of primary concern. Refreshments and local snacks will be served on the way back to port. Please note: This tour is not suitable for those with mobility issues. Whale and/or dolphin sightings are not guaranteed. Open-air gondolas, accompanied by a naturalist guide provide the one and only access to the upper layers of the rainforest. Ascending through the middle layer of the rainforest you will enjoy the fauna and flora. The Aerial Tram Tour will transport you up and away from the heat and bustle of the lowlands to an ecological park located in the heights of St Lucia’s forest reserve. Sixteen open-air gondolas ascend noiselessly through the rainforest, offering you a magical view of nature in its majesty – towering gommiers, impressive chatanniers, and the remarkable phenomenon of the strangler ficus, alighted upon by playful hummingbirds and banana quits. An experienced Nature Interpreter will point out giant ferns and magnificent heliconia, and identify the calls and the plumage of the birdlife that makes the Caribbean Oceanic forest its home. The descent will afford you a bird’s eye view of the forest and a spectacular panoramic vista of the north of the island. With much to see and listen for, the tram ride will be a celebration of color and life and a restorative retreat guaranteed to refresh the senses. Please note: Depending on traffic, the drive to the tram is about 40 minutes, and persons prone to motion sickness are asked to take the necessary precautions prior to the tour. Wear comfortable walking shoes for the trail. The walk after the Aerial Tram is optional. No high heels, sandals or flip flops are allowed. Bring sun protection, insect repellent, a camera and binoculars. The Aerial Tram is for all ages and fitness levels but is not wheelchair accessible. Departing Pigeon Island you will pass by the Cap Estate golf course before arriving at Cas En Bas beach for the start of your adventure. Hike up through the hills of Cas En Bas, along the northeastern coastline, allowing you to enjoy unbelievable scenery from beginning to end. Feel the fresh cool breeze of the Atlantic Ocean and see the waves crash against the cliffs below. A hike like no other, this adventure will take you through cactus valley and up to the peninsula, for a chance to see the neighboring island of Martinique on a clear day and the wild horses roaming on the hillside. On your return to Cas En Bas beach, a cool refreshing drink awaits you at Majorie’s Bar. You can choose to relax or have a dip in the ocean before you head back to your ship. Please note: Bring a towel, and swimwear to be worn underneath your clothing and your camera. Wear cool comfortable clothing, hats or caps and appropriate hiking shoes. Use Insect repellent if allergic to the tropics. Bring along sunscreen as there is limited shade throughout the hiking trail. Join a welcoming and professional crew aboard a beautiful racing yacht for an engaging sailing lesson and exhilarating voyage on the Caribbean Sea. Hop aboard the 40-foot Papagayo, the island’s only race yacht, for a brief orientation by her experienced crew. You will learn how to hoist the sail, fly the jib, winch and trim the sails and then take the helm of the vessel. Enjoy the surrounding scenery while gliding across Rodney Bay’s dazzling blue waters before returning to your ship. Please note: Guests prone to motion sickness are advised to take the necessary precaution for the sailing lesson. Life Jackets are available on board the yacht. The only day this tour may not operate is on Christmas Day. Explore at your leisure with a private vehicle, driver, and English-speaking guide. This exclusive tour will allow you to customize your time ashore and explore the most interesting sites in the comfort and privacy of your own car. With your private vehicle, and the personalized attention of your driver and English-speaking guide, you will have the flexibility and independence to design your itinerary ashore. See the iconic sites, or create your own personal stops to make the experience your own. Explore at your leisure with a private vehicle, driver, and English-speaking guide. This exclusive tour will allow you to customize your time ashore and explore the most interesting sites in the comfort and privacy of your own van. With your private vehicle, and the personalized attention of your driver and English-speaking guide, you will have the flexibility and independence to design your itinerary ashore. See the iconic sites, or create your own personal stops to make the experience your own. Explore at your leisure with a private vehicle, driver, and English-speaking guide. This exclusive tour will allow you to customize your time ashore and explore the most interesting sites in the comfort and privacy of your own car. With your private vehicle, and the personalized attention of your driver and English-speaking guide, you will have the flexibility and independence to design your itinerary ashore. See the iconic sites or create your own personal stops to make the experience your own. Segway riding is the latest adventure in St. Lucia. Come and experience this off-road thrill while enjoying nature at its best. Marvel at the technology of your Segway X2 and the ease of this type of transportation. Picture fun, safe, unique, and environmentally friendly gliding along while looking at breathtaking scenery in the heart of St. Lucia’s tourist district. Start your tour with a 20-minute practice session on your very own Segway practice track. Then you will embark on your Segway experience. Travel along the exclusive 1.5 mile well-groomed trail system. Learn about the island’s history and flora and fauna. See ruins of the old U.S. Naval Base and enjoy the beautiful vista of Pigeon Island, Reduit Beach, the Rodney Bay Marina, and the Caribbean Sea all while gliding effortlessly on your intuitive, eco-friendly Segway. One of your stops will be at a naturally occurring pond where you can feed the freshwater fish and then travel on to a local fruit stop at one of the spectacular viewpoints. The tour ends with a final “glide” back to return the Segway. Please note: Guests must adhere to all safety instructions throughout the entire tour. Helmets are mandatory and elbow and knee pads are available but not mandatory. Guests will be required to sign a waiver to participate on this tour. Weight limit is 250 lbs. Become a budding artist on the simply beatiful island of St. Lucia. As you leave Pigeon Island take a short drive to Rodney Bay Village, the heart of tourist activity on the island. The warm smile of your instructor welcomes you to Island Mix, the only place that is home to St. Lucian artisans and their designs. Interact with a local artist and participate in an Art Class – Yes you can paint!! Enjoy a fun-filled session as you interact with a professional artist who will guide you through all the steps to create your very own masterpiece. Enjoy watching your work of art unfold right before your eyes. At the end of the class, take home a painting designed by the newest artiste on the island – YOU!! Take a bird’s-eye-view of rainforest bird and plant life as you soar high above the ground on this zip line adventure. You will enjoy a one-hour journey along a somewhat winding road toward Dennery Fishing Village. Soon you reach the Zip Line Welcome Center in the heart of the rainforest. After a safety briefing you will be on your way along 4,000 feet of cables suspended between platforms. There are also two net bridges that provide access between platforms. The fully integrated system of cables and rigging is carefully designed to deliver a thrill all under safe conditions. Although this ride does not demand physical ability, the adrenaline rush is one you’ll long remember. Please note: You should wear tops with sleeves and avoid very brief shorts. Long hair must be pinned up and shoes should be well secured to your feet. Some step-climbing is involved. You will be required to sign a waiver to participate on this tour. Weight limit is 250 lbs. Imagine walking in zero gravity while surrounded by incredible aquatic life - that’s Sea Trek! Sea Trekking is as close as it gets to the sensations of walking in space. Take a walk on the “wet” side which brings you face to face with the marvel of marine life. Your tour will begin from the gently sloping sandy beach at Pigeon Island. All Sea Trek tours begin with a medical questionnaire and safety briefing. You will be equipped with a specially designed Sea Trek helmet, which sits comfortably on your shoulders. Trekkers breathe freely underwater from a continuous flow of air pumped in to the back of the helmet through a hose attached to a pod system. There are no masks, no mouthpieces, no stress and no complications. You can even wear your prescription glasses, as your entire head stays dry throughout your underwater adventure. Pre-certification is not necessary and swimming skills are not required. If you can walk and breathe, you can Sea Trek. Just relax on the beach afterwards before heading back to the ship. Please note: Due to a natural environment, there is never a 100% guarantee that a particular species of marine life will be seen. Bring towels, swimwear underneath your clothing, sunscreen, cameras and US cash if you wish to purchase additional beverages at the Jambe Des Bois restaurant in the park. You will be required to sign a waiver to participate in this tour. Weight limit is 250 lbs. Enjoy an underwater experience that offers the best way to go beyond snorkeling without the responsibility or commitment of a deep dive. SNUBA requires no time-consuming training, dive experience or bulky equipment, leaving you with absolute freedom and comfort to breathe easily under water and enjoy the tranquility and beauty of our Marine Life. Under the supervision of warm, friendly and certified SNUBA guides, you will intimately explore marine life from a fully guided and safe perspective. All SNUBA tours begin with the completion of a medical questionnaire and safety briefing. A pre-dive orientation will then be done which includes the dive guidelines and regulations. Divers are encouraged to proceed to depths according to their individual level of comfort. Whether you opt to cruise at the surface or descend to the maximum depth of 20 feet there will be no need to surface for air or to tussle with bulky equipment. The SNUBA excursion takes place at Pigeon Island where your ship will be waiting. Please note: Due to a natural environment, there is never a 100% guarantee that a particular species of marine life will be seen. Bring towels, swimwear underneath your clothing, sunscreen, cameras and US cash if you wish to purchase additional beverages at the Jambe Des Bois restaurant in the park. You will be required to sign a waiver to participate on this tour. Weight limit is 250 lbs. This 2-tank dive will visit both Boss Reef and Purple Rain Reef. Each dive will be about 45-50 minutes, with a surface interval between dives of approximately one hour. Juices and fruit will be served. Please note: Divers who have not logged a dive in the past 12 months will be required to take a refresher course which can be taken at an additional cost of $80. Please wear your swimsuit under your clothes and bring a towel. Waiver release forms must be signed and medical conditions must be disclosed. Please bring your C-card. Have you ever wondered what the underwater would look like but you can’t snorkel or SCUBA dive? Well now you can, with Grenada’s newest underwater adventure. You will discover what the underwater looks like in a “sit on top” double clear bottom kayak. The journey takes 15 minutes from the port to your starting point at Grand Mal Bay, next to the newly refurbish building formerly known as Sunset View Restaurant, on the West Coast. There you will board your kayak and begin your fantastic journey over the Grand Mal coral reefs, down to Cherry Hill, turn around and move on to Mollinere Bay where you will view the popular divers’ reefs, and experience the wonders of the underwater world. After 1 ¼ hours you will return to the Kayak house where you will recover from the wonders of the underwater world, with a swim in the calm bay, and a complimentary drink at the bar (rum punch, local beer, local fruit juice, soft drink or water) before you will be returned to the pier. Please note: Bring your swimsuit and towel, sunscreen and a hat and/or sunglasses. Guests will be required to sign a waiver to participate on this tour. Minimum age is 8 years old and maximum weight is 250 lbs. St. George’s offers a wonderful opportunity to begin the sport of SCUBA diving. Your package includes instruction and a shallow pool dive, as well as all equipment. Afterwards, you will proceed to a shallow dive area and explore the wonders of the beautiful waters of Grenada. Please note: Minimum age is 10 years old. This aromatic tour will allow you to learn about Grenada Nutmeg and organic chocolate production. You will head toward the island's west coast and visit the Gouyave Nutmeg Processing Station to discover how nutmegs are harvested, processed, and exported. Well protected behind high walls, you will travel one century back in time. No conveyor belts, no machines. The long processing chain of this precious spice starts off in the hands and nimble fingers of the experienced, diligent and incredible ‘’Mammas.’’ After, you will visit the Diamond Chocolate Plant which produces the “Jouvay” organic chocolate now ranked in the top 10 best chocolates in the world by National Geographic. The quality of the beans, the distinct taste and the country’s rich history of cocoa production have inspired L. A. Burdick Chocolate to partner with Grenada’s knowledgeable independent cocoa farmers in building a cocoa processing facility. After harvesting the beans, all fermentation, sorting, drying, roasting and conching is done on the premises of the factory. A visit to the cocoa tree garden and a rare and delicious chocolate tasting and sampling will conclude this enjoyable tour of one of the most amazing sites in the Caribbean. Please note: This tour is appropriate for guests who are able to walk about 100 yards and must be able to walk on and off the motor coach unattended. Tour order may vary. Taking photographs is not allowed in the Nutmeg Processing Station. One complimentary fresh local juice per person will be served. Please note: Wear comfortable walking shoes and bring a hat, sunglasses, your camera and sunscreen. Experience the hustle and bustle of the picturesque capital of Grenada by comfortably strolling through its quaint streets. You will begin your tour with a brief stroll through Fort George for some incredible views before you walk through the Sendall Tunnel, which was constructed to facilitate travel between alternate ends of the city in 1894. The tunnel was named for Sir Walter Sendall, who was a British Colonial Governor. Just around the corner is the Grenada National Museum which is housed in a building which served as the French barracks from 1704. It later became two different hotels under different owners. Once you reach the north end of The Carenage, get your cameras ready as it is said to be the most picturesque harbor in the Caribbean and this vantage point will offer you some great photo opportunities. Next you will make your way to Church Street; The Catholic, Anglican and Presbyterian Churches, all built around the 1800s, can all be found here and you will notice that some were damaged by Hurricane Ivan in 2004 and are now mere remnants. From here you will venture down the famous Market Hill, whose slopes resemble those of San Francisco and then walk around the Market Square where you will see fresh fruits and vegetables and spices being sold. Here you will be served a refreshing drink before heading back to the ship. Your tour will begin with a leisurely drive along the Gold Coast, home to many wealthy residents, and will take you to the stunning area of Bathsheba. This is where the Atlantic surf pounds the coastline and it is a famous spot for international and local surfing competitions. A walk on the beach is a must. Heading into the hills, you will arrive at St. John’s Church. There are stunning views from the churchyard - a perfect photo opportunity. The church contains an interesting sculpture depicting the Madonna and Child with the infant St. John. The graveyard contains the tomb of Ferdinand Paleologus, a descendant of the Byzantine Imperial family. The present building was constructed in 1836, and the pulpit is constructed from six different kinds of wood: ebony, locust, Barbados mahogany, manchineel, oak and pine. Through sleepy country villages and sugar cane fields, you will make your way to Sunbury House dating back to 1650. The house was destroyed by fire in 1995, and was gracefully restored and re-opened in 1996. It possesses one of the country's superior collections of antiques. The cellar houses a unique collection of antique carriages, the largest collection in the Caribbean, as well as many items used in the domestic life of the plantation. It also houses a very old collection of optical machinery and sight testing equipment, some of the first to come to the West Indies including the first lens grinding plant. Enjoy a light deli-style lunch with a complimentary rum or fruit punch. A short drive will take you to the airport where you will be met and assisted with your luggage and airline check-in. Please note: There are about 20 steps to climb at Sunbury House and 10 steps down to the cellar. This tour will end with a drop off at the Grantley Adams International Airport or the Accra Beach Hotel. Please note: There are about 20 steps to climb at Sunbury House and 10 steps down to the cellar. Harrison's Cave is a magnificent natural phenomenon, quite in a class of its own and one of the most spectacular natural attractions in the entire Caribbean. After checking in at the Visitors Center, you will be taken into a theatre where you will watch a short film on the formation of Barbados. Then you will board the electric tram that will take you down into the cave. As the driver pulls away, your guide will accompany you and you are on your way to a memorable experience - magnificent chambers, incredible stalactites and stalagmites, bubbling streams, tumbling cascades, plunging waterfalls and emerald pools. Throughout the almost mile long cave the flowstone covered walls glisten in the lights as the calcite laden waters drip down from the roof. You will then head to Sunbury House dating back to 1650. It possesses one of the country's superior collections of antiques. The cellar houses a unique collection of antique carriages, the largest collection in the Caribbean, as well as many items used in the domestic life of the plantation. It also houses a very old collection of optical machinery and sight testing equipment. Enjoy a light deli -style lunch with a complimentary rum or fruit punch. A short drive will take you to the airport where you will be met and assisted with your luggage and airline check-in. Please note: There are some steps at Harrison’s Cave and a very steep step up into the tram. To access the top floor of Sunbury House there are 20 steps up and also 10 steps down to the cellar. Harrison's Cave is a magnificent natural phenomenon, quite in a class of its own and one of the most spectacular natural attractions in the entire Caribbean. After checking in at the Visitors Center, you will be taken into a theater where you will watch a short film on the formation of Barbados. Then you will board the electric tram that will take you down into the cave. As the driver pulls away, your guide will accompany you and you are on your way to a memorable experience - magnificent chambers, incredible stalactites and stalagmites, bubbling streams, tumbling cascades, plunging waterfalls and emerald pools. Throughout the almost mile long cave the flowstone covered walls glisten in the lights as the calcite laden waters drip down from the roof. You will then head to Sunbury House dating back to 1650. It possesses one of the country's superior collections of antiques. The cellar houses a unique collection of antique carriages, the largest collection in the Caribbean, as well as many items used in the domestic life of the plantation. It also houses a very old collection of optical machinery and sight testing equipment. Enjoy a light deli -style lunch with a complimentary rum or fruit punch. A short drive will take you to the airport where you will be met and assisted with your luggage and board a different bus to your hotel. You will hop into the back of one of the covered vans that are the signature mode of transportation on the island of Bequia. Drive through the main town of Port Elizabeth to head to Fort Hamilton, an old fort 300 ft. above sea level where you will enjoy a magnificent view over Admiralty Bay. You will see the cannon used by the French centuries ago in their war against the British. Mount Pleasant is your next stop. On this hill you will enjoy magnificent views of homes and the bays that surround the island. Moving along the Atlantic shoreline into Industry Bay you will visit The Old Hegg Turtle Sanctuary for a guided tour by Orton King, who spends his time tending to the endangered Hawksbill sea turtles from birth until they are ready to go back into the sea. Then head back down to the harbor, to your waiting yacht. Please note: Bring sunscreen and wear comfortable walking shoes. What better way to enjoy the Caribbean than to engage in what the area is best known for! A coastal scenic trip and a bit of snorkeling are just the right combination to provide some adventure. You will climb aboard an adventure power boat and set off towards one of the island’s snorkel sites. See tiny shellfish in their natural habitat and watch the schools of fish dart playfully around you. After a while in the water you will return to your boat where the Captain’s famous rum punch will be served. Enjoy the scenery as you sip on your beverage and your boat takes you back to the pier and your waiting yacht. Please note: Wear your swimsuit under your clothing and bring a towel. You may stay on board and enjoy the atmosphere if you choose not to snorkel. Experience the underwater magic of Bequia as you head out for a dive in the warm tropical waters surrounding this beautiful sailor’s paradise. You will be picked up at the dock for a 35-minute boat ride to the diving site where you will have 45 minutes to explore. Please note: Bring sunscreen and a hat. Life jackets and diving tanks will be provided. Experience the underwater magic of Bequia as you head out for a dive in the warm tropical waters surrounding this beautiful sailor’s paradise. You will be picked up at the dock for a 35-minute boat ride to the diving site where you will have 45 minutes to explore the underwater beauty. You will spend an hour of surface time before your second 45-minute dive. Enjoy power cruising over to the island of the rich and famous. Discover Mustique, a 14-acre gem with fertile valleys surrounded by coral reef, coves and dazzling beaches. You will enjoy a coastal tour while boating in along the coast, the history and homes of this exotic getaway of the rich and famous are pointed out at this time. Upon arrival visit the unique shops, relax on one of Mustique’s white-sand beaches or enjoy the vividness and beauty of the underwater marine life or take an optional taxi tour around the island. The tour continues with a delicious local lunch at an island restaurant. Have a swim before heading back to Bequia. Please note: This power boat experience may have waves and splashing and is not recommended for persons with back problems. Wear your swimsuit under your clothing and bring a towel. Bring a hat, local and US currency and sunscreen. An exciting introduction to St. Lucia and a marvelous way to experience the beauty of the Island’s coastline, is by cruising to see the most photographed landmark in St. Lucia - The Pitons, a UNESCO World Heritage Site. 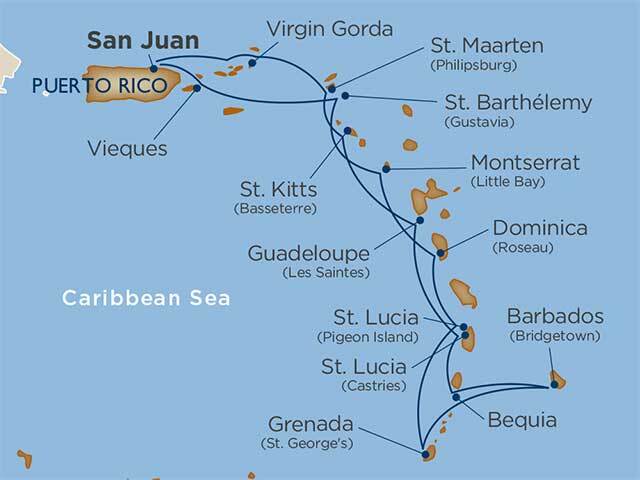 Board a Catamaran and depart the Castries harbor passing the Vigie and La Toc peninsulas before heading to the south of St. Lucia. Take in the amazing views of the lush vegetation along the rolling mountainsides of the coastline. Pass the fishing villages of Anse La Raye and Canaries. Continue on towards the Soufriere Bay for the sighting of the Petit and Gros Pitons – rising majestically to over 2,600 feet out of the sea. These are picture taking moments are not to be missed. With cameras in hand, get ready to capture the perfect shots of these volcanic plugs as your boat circles the area. Your cruise will continue up along the coast to one of the bays for a relaxing swim in the cool waters of the Caribbean Sea. Return on board for a fun journey back to the port with music, dancing, and a cruise into Marigot Bay - one of the Island’s most sheltered bays also renowned for its beauty and used as a film location for such movies as Dr. Doolittle and Firepower. Snacks and refreshments will be served on board and then it is fun time before arriving back at the Castries harbor and your waiting ship. Please note: Bring a towel, swimwear to be worn underneath clothing, wear cool comfortable clothing and appropriate sandals/shoes with rubber soles. Bring insect repellent if allergic to the tropics, sun screen and cameras. Guests prone to motion sickness are advised to take the necessary precautions prior to the tour. Alcoholic beverages are only served after swimming. All persons are to use the water ladder with steps to enter the water and no jumping off the boat will be allowed at any time. Please note: Capacity: 1-2 guests. Private vans are ordered per vehicle (not per person). This tour includes transport in a private van, driver and English Speaking Guide. Itinerary can be adjusted with tour guide as long as it’s in the area and does not exceed the duration of 8 hours. Recommended for physically challenged guests. Explore at your leisure with a private vehicle, driver, and English-speaking guide. This exclusive tour will allow you to customize your time ashore and explore the most interesting sites in the comfort and privacy of your own van. With your private vehicle, and the personalized attention of your driver and English-speaking guide, you will have the flexibility and independence to design your itinerary ashore. See the iconic sites or create your own personal stops to make the experience your own. Please note: Capacity: 3-6 guests. Private vans are ordered per vehicle (not per person). This tour includes transport in a private car, driver and English Speaking Guide. Itinerary can be adjusted with tour guide as long as it’s in the area and does not exceed the duration of 4 hours. Recommended for physically challenged guests. Be a part of St. Lucia’s rich history and culture. You will depart from the pier on a relaxing drive in an air-conditioned bus through the historic city of Castries. You will pass many buildings of historic significance and drive up the winding Morne Fortune Road for a stop at the panoramic viewpoint where you will see Castries Harbor and the northern landscape. Continuing on your tour, you will drive past the official residence of the island’s governor-general before arriving at Eudovic’s art studio, known for its exquisite local woodwork and intricate carvings. You will see an actual woodcarving demonstration and have the opportunity to purchase a souvenir. You will then take a scenic drive through the countryside to the Fond Latisab Creole Park. Experience such local traditions as cassava bread making, cooking on macambou leaves, see authentic 2-handed sawing to the rhythm of a shak shak band and participate and learn the Creole folk dance. Please note: Wear comfortable walking shoes, bring your camera, sunscreen and US cash if you wish to purchase souvenirs. Once considered the dessert for monarchs and aristocrats, chocolate has since filtered through to the mainstream. The tree to bar chocolate class at Howelton Estate features the use of St. Lucia's trinitario cocoa beans, which are treasured by renowned chocolatiers for their aromatic indulgencis on one’s senses. The class will begin with the manual grinding of cocoa nibs which have been broken down from dried trinitario beans grown on the island. With the use of a mortar & pestle, class participants under the guidance of the house chocolatier, grind nibs until they transform into liquefied chocolate. The breakdown process can take up to 45 minutes adding in personal touches of desired flavors along the way, which makes each chocolate a unique signature bar. Throughout the class, information on the multiple benefits of the trintario chocolate is disseminated as dark chocolate is renowned for its fascinating health benefits. There is a 20-minute cooling down period to allow the liquefied chocolate to solidify after it has been put into its mold. The break will allow time for taking in the amazing views of the city, while enjoying a beverage from the Cellar Bar or browsing the duty free gift shop among other options. After the break, class will resume and the end result will be a beautiful 1.8 ounce (50 grams) dark chocolate bar that is foil wrapped and can be taken home as perhaps the most distinctive souvenir of St. Lucia. Please note: Bring US Dollars or Credit Cards (American Express, Master Card or Visa). Depart the port and drive through the city of Castries to the Rainforest located along the east coast of St. Lucia near the fishing village of Dennery. At the Welcome Centre situated in the heart of the rainforest you will be given a safety briefing and geared up for the ride. Although this ride does not demand physical ability, the adrenaline rush is like no other. It is a rocket ride from between 30 feet to 130 feet off the forest floor on just over 4,000 feet of cables suspended between platforms. During the course you will encounter 2 fun net bridges to access the next platform. The course is a system of integrated cables and rigging carefully designed to deliver a thrill safely. Between zips there is plenty of time for a unique view of the forest, the birds and plants that inhabit it. This Tree Top Canopy Adventure Tour is fun for the whole family and it is a Caribbean memory you will talk about long after your holiday is over. Please note: Wear closed sandals (with rubber soles) or trainers – NO flip flops/slippers. People with heart conditions are not encouraged to participate in this tour. Each participant must sign a disclaimer before participating on the tour. Please note: Wear comfortable walking shoes or trainers – NO flip flops/slippers. Wear your bathing suit under comfortable clothing. People with heart conditions are not encouraged to participate in this tour. Bring a towel, your camera and insect repellent. Board a well-appointed boat – with PADI Qualified Diving Professionals – where you will be welcomed and waivers will be signed. Then take a leisurely cruise along the west coast of St. Lucia bypassing a few resorts and fishing villages before arriving at your first destination for diving anywhere within the Marine Reserve which spans from the village of Anse La Raye to Soufriere. Depending on the sea conditions, your dive master will indicate which will be your dive sites where you can explore the gardens of coral in the Marine Reserve and the wonderful array of fish – snapper, sturgeon, parrot, tiger and more. After your first dive you will return to the boat for refreshments and granola bars before heading out for your second dive which could include either a wreck or wall dive. You will then return to the port and your waiting ship. Please note: There is a 1-hour rest period between the first and second dives and the depth can be anywhere between 60 – 80 feet. Snorkelers are also included on the same boat and apart from having the opportunity of using two sites will also spend the same time on board with the divers. Cancellations require 24-hour notice prior to tour without penalty. Cancellations received on the day of tour require full payment. If the minimum numbers are not met the tour may be cancelled. Here is an exciting excursion in the archipelago of Les Saintes. You will start from the tender pier with a 1-minute walk to your waiting guide and speedboat. You will board your comfortable boat and head along the coast. You will then be taken to the Grand Bay of Terre de Bas, the second inhabited island of Les Saintes archipelago. You will be navigated through the crystal clear waters near the old pottery ruins dating back to the 18th century. Then you will head to the beautiful Pain de Sucre Beach where you will have time to go for a swim on your own here. You will be offered some local drinks and snacks before heading back to the pier. Please note: This tour is weather dependent and guests must have no mobility issues. You will have to bring your own snorkeling equipment, swimsuit, towel, sunscreen, sunglasses and a hat. Explore the pristine turquoise waters of Les Saintes aboard a “clear-bottom” kayak. Following a short walk from your tender pier your adventure begins. Accompanied by a knowledgeable guide, you will paddle over translucent waters and learn about the lifestyles of the island, its history, and its exquisite coral reef surrounds. No experience is necessary as the 2-person kayaks are easily maneuverable. Set against the backdrop of one of the most beautiful bays in all the Caribbean, this relaxing and fun-filled experience is one not to be missed. Please note: Wear light clothes, hat or visor, sunscreen, and sunglasses. This is a fantastic 3-hour catamaran excursion with snorkeling possibilities at different sites in the archipelago of Les Saintes. The Captain and the Guide are committed to providing you with a fun, safe, and comfortable experience, allowing you to take in the natural beauty of the archipelago. You will navigate the archipelago of Les Saintes and then navigate around the islands of Terre de Haut and Terre de bas – the two inhabited islands. Continue to the four most remote islands of the archipelago; Grand Ilêt, La Coche, Les Augustins, and the Virgin Rock. Continue sailing to the beautiful Pain de Sucre Beach. Here you will have time to go for a swim on you own in the crystal clear waters with an array of colorful tropical fish. You will have drinks and snacks before heading back to the pier of Les Saintes. Please note: This tour is weather dependent and guests must have no mobility issues. Wear light clothes, hat or visor, and sunscreen, and bring your swimming suit, towel, and sunglasses. Fort Napoleon has a rich history and is the setting for some of the most dramatic harbor views in the Caribbean. Join your English-speaking guide at the pier where a private shuttle will bring you to the gate at the top of Napoleon Hill. Afternoon entry to the fort allows a more intimate opportunity to enjoy the history of the fort, its gardens, and eclectic museum collection depicting life on the island over the last 2500 years. Following your guided tour of these areas, you will retreat to the original fort’s kitchen where you will sample a variety of local, iconic foods including the famous local cakes. No Windstar tour in the Caribbean would be complete without a taste of rum and today you will sample the “Sun Rum” mixed on the island. When you are ready to leave you have the option to hike back to the town or take advantage of the shuttle service provided for you. Please note: This exclusive tour accommodates a maximum of 24 people. Space is limited, sign up early. On this tour, you will enjoy an overview of the capital of St. Kitts & Nevis and get an up-close look at the island's colonial splendor. Board your motor coach for the 30-minute drive with your guide into Basseterre, one of the oldest towns in the Eastern Caribbean. Admire impressive Victorian and Georgian architecture and view important landmarks such as the Berkeley Memorial Clock Tower and Independence Square, once a slave market and today host to a picturesque fountain and a centuries-old church. You will stop at the Fairview Great House and Botanical Garden. At this 300-year-old colonial property, you will explore perfectly preserved rooms, including the original kitchen with its volcanic stone and brick oven and the bathing room with its sun-warmed bath. Follow the stone bridge to the lush tropical botanical garden, where many of the plants such as palms and fruit trees date back as far as the 1700s. Then explore the 300-year-old Brimstone Fortress, perched 780 feet above sea level. This magnificent structure is the second largest of its type in the entire Western Hemisphere and is one of the best preserved. This Gibraltar of the West Indies is a UNESCO World Heritage Site and more battles were fought here than at any other single site in British and French naval history. Its spectacular panoramic views include part of the Kittitian coastline, countryside and five neighboring islands. Please note: This tour is not wheelchair accessible. Please note: Dress in comfortable, casual clothing, bring a towel, your swimsuit and sunscreen. Lunch is included on this tour. Experience the interior of St. Kitts’ mountains. St. Kitts, a volcanic island, is blessed with mountainous slopes that are lush with rainforest and offer majestic views. You will enjoy the off-road thrill as you drive your very own iconic Jeep Wrangler. Your tour will begin with a short drive to the Jeep Wrangler base where you will receive a short orientation then you are off to a fun adventure. You will drive to the first off road mountain trail, where at the top of the mountain you can take in a panoramic view of the valley of Basseterre with your ship in the background as well as the cool breeze and the natural beauty of the area. Drive back down the mountain and up yet another mountain top which will give you a panoramic view of St. Peters and the Southeast Peninsula. Continue your tour and curve around off road trails passing the international airport where on some days you can see planes land and take off. After your trip through the interior of St. Kitts, drive to Vibes Beach Bar which has a perfect blend of island bar and sports bar atmosphere, filled with all the amenities you expect at a beach bar. Sun bathe or swim in the calm Caribbean Sea and enjoy a rum of fruit punch until it is time to return to your ship. Please note: Bring your swimwear, towel, and sunscreen. US dollars or credit cards are accepted here. Price is per jeep with a maximum of 4 persons/jeep. You are invited to take a dip in the crystal clear waters of the Caribbean Sea, tango with the sea life, and then relax on the golden sandy beach of South Friars Bay … that is Snuba in St. Kitts. You will enjoy a scenic 20-minute drive over to the Snuba dive site, passing the majestic stately homes of Frigate Bay, the manicured greens of the Royal St. Kitts Golf Course, and the breathtaking ascent to Timothy Hill, while viewing the energetic Atlantic Ocean on the one side and the serene Caribbean Sea on the other. On arrival at the dive site on South Friars Beach, home of the prestigious Carambola Beach Club and fine golden sand, you will gear up, receive your orientation and you are ready. Dive in!!!! After your great underwater experience, you can gear down, and enjoy some beach time, a swim in the cool clear waters, or just sunbathing. Please note: Bring adequate sun protection, swimsuit and towel, a hat and/or sunglasses. You will be required to sign a waiver to participate in this adventure. Completely circle the island of St. Kitts by road and rail in just a few hours. The St. Kitts Scenic Railway is a narrow-gauge railroad that was built almost a century ago to deliver sugar cane from the fields to the mill in Bassetèrre. Each railcar features seating on two levels. The upper level features a spacious open-air observation deck offering panoramic views of the surrounding countryside, while the lower level provides air-conditioned comfort. Island ambiance will be evoked with comfortable rattan furniture, complimentary specialty drinks, island music by the Scenic Railway Choir, and an informative narrative history of the Caribbean. In addition to your rail experience, your sightseeing will also feature a scenic drive by bus along the southwestern coast. Enjoy unparalleled vistas of Brimstone Hill Fortress, the British “Gibraltar of the West Indies,” Middle Island where Thomas Jefferson’s great-grandfather is buried, and the neighboring island of Nevis, birthplace of American statesman Alexander Hamilton. Please note: Bring your camera, sunscreen, sunglasses, and a hat if you are planning on sitting on the upper level. Fly along zip lines up to 1,400 feet in length, 25 stories above the ground! This is a spectacular 5-line zip line journey based at the Historic Wingfield Estate. After a short orientation, training session, and riding the first (trainer) line, you will hop into vehicles for a trek up the famous Valley of the Giants where you may encounter monkeys in the wild fruit trees. You will see fantastic panoramic views of Brimstone Hill Fortress, Old Road Village, former sugar estates, the Caribbean Sea, and Mount Liamuiga. With a mile of zip lines you will soar at speeds up to 50 miles per hour. Thanks to the cutting edge technology of this system you will fly hands and feet free, just like a bird. All you have to do is sit back, and enjoy the experience! You will also be given an opportunity to walk around the Wingfield Estate Ruins. View the first British masonry in the entire New World as well as the remnants of the different methods of processing sugar which are all on site. As an additional treat your tour also includes a short walk to the Romney Manor, home of Caribelle Batik, where you can enjoy the enchanting gardens, batik studios, and gift shop. Please note: This tour is not available for guests who are pregnant, have a heart condition or serious medical condition, previous neck or back injuries. To participate on this tour guests must wear closed-toe shoes, weigh at least 60 pounds but no more than 275 pounds and sign a waiver. Any guests wishing to bring along personal items will have the option to leave items at the base and rent a locker to store them in. Price per locker is $3 US and payable directly to the Sky Safari facility. Experience the pleasure of snorkeling at several sites that are abundant with tropical fish and coral life. There will be a short 10-minute walk from the pier to the marina where your boat awaits. Then you will cruise the island’s pristine southeast peninsula, inhabited by the shy green vervet monkey. Snorkeling opportunities include Ballets Bay, Shitten Bay, and Bugs Hole. Marine life varies but you may see: turtles, eagle rays and stingrays, schools of saltwater chub, snapper, angel fish, parrot fish, squirrel fish, and sand sharks. Many virgin reefs and extensive soft corals, fans, and sponges make up the reef life. Thirst-quenching non-alcoholic drinks, local beer and water will be provided. Please note: Wear your swimsuit under your clothing and bring a towel. (Towels will be available at the gangway.) Your waiver release form must be signed and medical conditions must be disclosed. Access to and from the water is done by a ladder on the side of the boat. Here is a unique way to experience the Caribbean! This exciting exploration will begin with a transfer from the dock to the Quad Bike (ATV) base. After an introduction and full orientation on the use of the bikes and safety precautions, you will be ready to mount the four-wheel ATV bikes for a wildly exhilarating adventure. Your experienced guide will lead you on a thrilling ride through cane fields and down country dirt tracks and up scenic slopes with views of neighboring islands. On the way you may also be able to taste local fruits in season. Then it will be time once more to get back on the bikes and return to the tour base. Enjoy a cool drink before you will be transferred back to the pier. Please note: You will be provided with a helmet. This tour is not recommended for those with mobility issues or back problems as you will be traveling off road over hilly and bumpy terrain. You will be required to sign a waiver to participate on this tour. Maximum weight is 250 lbs. Please note: Capacity: 3-6 guests. Private cars are ordered per vehicle (not per person). This tour includes transport in a private car, driver and English Speaking Guide. Itinerary can be adjusted with tour guide as long as it’s in the area and does not exceed the duration of 4 hours. Recommended for physically challenged guests. Experience St. Maarten’s newest attraction, the Soualiga Sky Explorer chairlift. Take a tranquil ride up the 2,630-ft. span as the landscape unfolds below to the top of one of St. Maarten’s highest mountains where spectacular panoramic views await you. You will board your air-conditioned transportation at the dock for a 30-minute ride to Rockland Estate. You will be guided to the plantation house, built in the 1700s, to learn the powerful story of Trace Wilson, born into slavery on the estate in 1818 and his descendant Emilio Wilson who purchased the property to educate current and future generations about the conditions of plantation life as well as the customs, traditions and history of St. Maarten, “The Friendly Island.” After a brief orientation, embark the Soualiga Sky Explorer for the approximately 25-minute ride to the top of Sentry Hill, St. Maarten’s highest elevation at 1,125 feet. A series of platforms encircles the mountaintop showcasing 360-degree views of the whole island including vistas of neighboring islands. When you are ready to descend simply board the Soualiga Sky Explorer for the scenic trip down the mountain. Enjoy exploring the estate and sampling St. Maarten delicacies, snacks and beverages at the restaurant. When you are ready to depart you can board the air-conditioned shuttle transportation back to your ship. Please note: Bring sunscreen and insect repellent and wearing close-toed and secured shoes is required. Currency accepted is US dollars or credit cards. As an adventure-seeker you will simply love this new thrill ride that takes you on the Soualiga Sky Explorer with the landscape unfolding below to the top of St. Maarten’s highest mountain. Then you’ll go flying back down on one of the world’s steepest ziplines. You will board your air-conditioned transportation at the dock for a 30-minute ride to Rockland Estate. You will be guided to the plantation house, built in the 1700s, to learn the powerful story of Trace Wilson, born into slavery on the estate in 1818 and his descendant Emilio Wilson who purchased the property to educate current and future generations about the conditions of plantation life as well as the customs, traditions and history of St. Maarten. Embark the Soualiga Sky Explorer for the approximately 25-minute ride to the top of Sentry Hill, St. Maarten’s highest elevation at 1,125 feet. A series of platforms encircles the mountaintop showcasing 360-degree views of the whole island including vistas of neighboring islands. A brief orientation will prepare you to fly down the mountain at speeds of up to 56 miles per hour on the world’s steepest zipline, The Flying Dutchman. You’ll be attached to a flight line in a secure harnessed chair, launching you on the 1050-foot drop in elevation over 2,800 feet to experience the ride of a lifetime. After your fun-filled adventure, select your favorite photo and video then enjoy exploring the estate and sampling St. Maarten delicacies, snacks and beverages at the restaurant. When you are ready to depart board your air-conditioned shuttle transportation back to the ship. You will board your coach for the 30-minute ride to the Bacardi Distillery. Start your tour at the new Bacardi Visitor Center. Learn about the past, present, and future of the world’s most awarded rum and spirits. Relive the history and see how Bacardi evolved from being a small rum manufacturer in Santiago de Cuba to becoming the untameable Spirit that it is today. You will learn about Bacardi’s rum making process, its legendary cocktails, and you will be tasting 4 of the best hand-crafted cocktails prepared by Bacardi mixologists. There will be time to visit the Gift Shop and find an array of Bacardi rums, souvenirs, and collectibles. Bottles can even be engraved. You will enjoy the view of Old San Juan from their pavilion that’s shaped like a bat or just sit back and relax in the Lounge. You will find out why tourists have made Bacardi a must see in Puerto Rico.You will be transferred to the airport. Please note: Wear comfortable attire and walking shoes. Guests must be at least 21 years of age to participate on this tour. You will board your coach for the 30-minute ride to the Bacardi Distillery. Start your tour at the new Bacardi Visitor Center. Learn about the past, present, and future of the world’s most awarded rum and spirits. Relive the history and see how Bacardi evolved from being a small rum manufacturer in Santiago de Cuba to becoming the untameable Spirit that it is today. You will learn about Bacardi’s rum making process, its legendary cocktails, and you will be tasting 4 of the best hand-crafted cocktails prepared by Bacardi mixologists. There will be time to visit the Gift Shop and find an array of Bacardi rums, souvenirs, and collectibles. Bottles can even be engraved. You will enjoy the view of Old San Juan from their pavilion that’s shaped like a bat or just sit back and relax in the Lounge. You will find out why tourists have made Bacardi a must see in Puerto Rico.You will be transferred to your hotel. Not every day will you get an opportunity to visit the 2nd oldest city in the world. For about 90 minutes you will walk the cobblestone streets accompanied by an expert guide who will give you interesting information on many amazing structures and relate events that make Old San Juan a must-do on your bucket list. You will visit San Cristobal Fort, the largest fort built by the Spanish in the New World. Learn the mystery of the sentry boxes and other memorable facts. On the way to the airport you will also have the opportunity to visit and learn the history of the Tapia Theater, Plaza Colon, Plaza de Armas, La Rogativa, The San Jose Church, The Governor’s Main House, San Juan Cathedral, and other interesting sites. Please note: Wear comfortable attire and walking shoes. Not every day will you get an opportunity to visit the 2nd oldest city in the world. For about 90 minutes you will walk the cobblestone streets accompanied by an expert guide who will give you interesting information on many amazing structures and relate events that make Old San Juan a must-do on your bucket list. You will visit San Cristobal Fort, the largest fort built by the Spanish in the New World. Learn the mystery of the sentry boxes and other memorable facts. On the way to your hotel you will also have the opportunity to visit and learn the history of the Tapia Theater, Plaza Colon, Plaza de Armas, La Rogativa, The San Jose Church, The Governor’s Main House, San Juan Cathedral and other interesting sites..
Board your coach for the 45-minute drive to discover the exotic vegetation of El Yunque, the only tropical rainforest in the U.S. National Park System. El Yunque features over 240 species of plants and wildlife, waterfalls, streams, and hiking trails leading to enchanting locations. With a professional guide you will visit El Portal Visitor Center, La Coca Falls, and a low-moderate impact trail to admire the flora and fauna. Your expert guide will make the trip meaningful and fun. Then transfer to the airport. Please note: Wear comfortable attire and non-slippery shoes. Board your coach for the 45-minute drive to discover the exotic vegetation of El Yunque, the only tropical rainforest in the U.S. National Park System. El Yunque features over 240 species of plants and wildlife, waterfalls, streams, and hiking trails leading to enchanting locations. With a professional guide you will visit El Portal Visitor Center, La Coca Falls, and a low-moderate impact trail to admire the flora and fauna. Your expert guide will make the trip meaningful and fun. Then transfer to your hotel..